Nick Jans leads us into his “found” home --- the Eskimo village of Ambler, Alaska, and the vast wilderness around it. In his powerful essays, the rhythms of daily arctic life blend with high adventure --- camping among the wolves, traveling with Inupiat hunters, witnessing the Kobuk River at spring breakup. The poignancy of a village funeral comes to life, hordes of mosquitoes whine against a tent, a grizzly stands etched against the snow --- just a sampling of the images and events rendered in Jan’s transparent, visual prose. Moments of humor are offset by haunting insights, and by thoughtful reflections on contemporary Inupiaq culture, making A Place Beyond a book to read and enjoy. Nick Jans, teacher and writer, looking to flee “a future that looked all too certain”, drove five-thousand miles to Alaska. In these simply written, brief, and pleasurable essays, Jans vividly describes the mundane aspects of his life in Arctic Alaska, as well as the wild and unpredictable. He writes of repairing a snowmobile, camping among wolves, his students’ love for basketball, the treacherous mosquito season, the breaking up of the Kobuk River, and hunting with the Inupiat Eskimos. He writes movingly of a friend’s death and burial, and a Christmas Eve celebration. I have some fascination with Alaska and was thrilled to win this through the “First Reads” program on Goodreads. 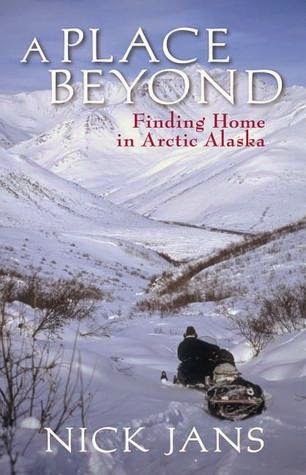 If you are at all interested in Alaska, Inupiat life and culture, wilderness, and changing seasons, then I recommend this thoughtful and introspective collection of essays.